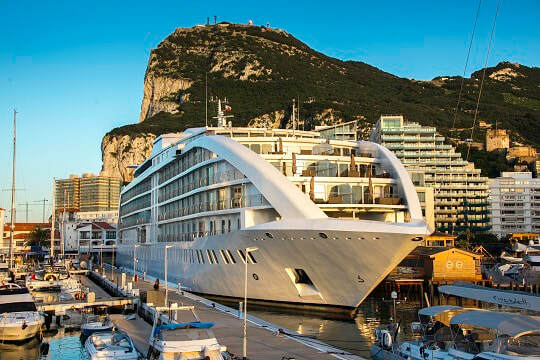 It's small compared with the giant cruise ships that dock not far away under the Rock of Gibraltar, but this sleek ship that doesn't move is in a class of its own. 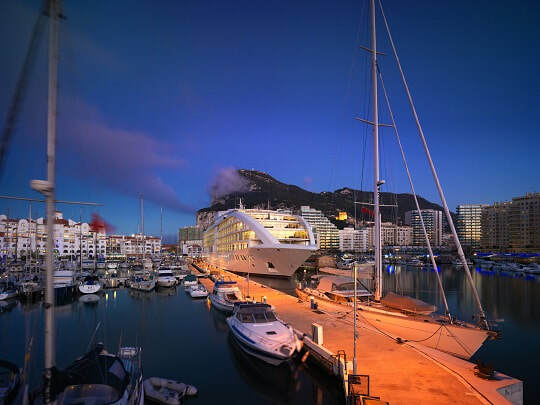 Sunborn Yacht Hotel is the world's first floating five-star hotel - a permanent fixture in Western Europe’s southernmost tip - Gibraltar's Ocean Village Marina. The super yacht-hotel that has never sailed was shipped to Gibraltar from Malaysia, where it was built for a Finnish-owned family company. Costing 120 million pounds, the purpose-built super yacht hotel is 142 metres long and has 189 lavish and spacious rooms in five categories, including six penthouse suites that you will set you back 1500 pounds a night. As well as the rooms on its seven decks, there’s an infinity pool, and sundeck spa, casino, three bars and two restaurants, gymnasium, banqueting suites and conference facilities. Director of sales, Britta Weiser, says the hotel’s main clientele come from the UK, but “Australians have discovered Sunborn”. She says Sunborn organises tours to Morocco and Spain, which are on Gibraltar’s doorstep. “The ferry to Morocco takes only 45 minutes and there are short flights from Gibraltar to Casablanca and Tangier. Spain is just on the other side of Gibraltar’s runway. “Apart from the many attractions around The Rock, there are sea tours in the Strait of Gibraltar, where there are some 300 dolphins”. For such a small country – it measures just over six square kilometres in total – Gibraltar, a British Overseas Territory, has a staggering number of important attractions. These include St Michael’s Cave, the Skywalk, Great Siege Tunnels and World War 11 tunnels. And Gibraltar is the only place in Europe where monkeys roam freely in a semi-wild state, reflecting the Rock’s natural history. 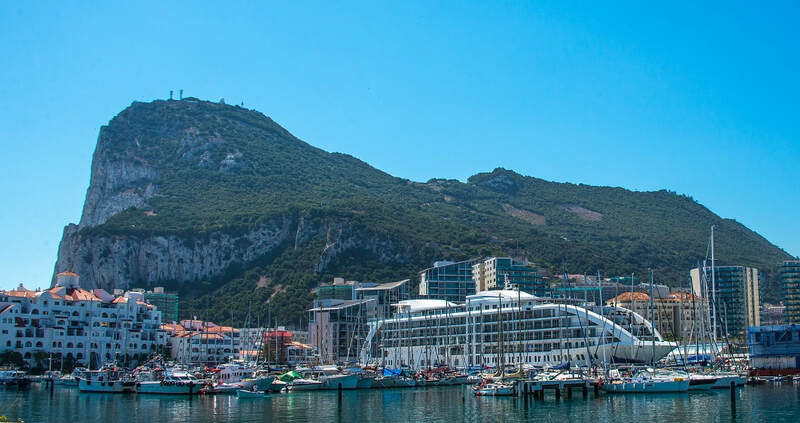 British, Spanish, Genoese, Indian, Jewish, Maltese, Moroccan and Portuguese are a fascinating blend of cultures that have all left their stamp throughout Gibraltar’s rich and tumultuous history, which date back to Neanderthal times. *The Sunborn Group also owns another luxury yacht-hotel that has never graced the ocean waves. It’s permanently berthed at London’s revitalised Royal Victoria Dock. The four-star, 128-metre yacht-hotel was built in Finland.